Drug-induced gingival overgrowth or enlargement occurs in whole or in part from systemic drug use. It occurs as a side effect following the administration of drugs used mainly for non-dental treatments and thus, the overgrowth cannot be explained as a variation of the intended pharmacological action of the drug. Several factors namely; age, genetic predisposition, presence of preexisting plaque, and gingival inflammation influence the relationship between the drugs and gingival tissue. There is a variable gingival response in patients taking drugs. Indeed, the term ''responders'' and ''nonresponders'' appear in the literature. Furthermore, within the group of patients that develop this unwanted effect, there appears to be variability in the extent and severity of the gingival changes. On the contrary, there is infinitesimal awareness about this effect of drugs on gingival tissues in medical community. To date there has been no clear cut literature which could consolidate the pathogenesis, clinical manifestations, and the management of affected patients. There is a need of exposition which would refine our knowledge about known drugs and familiarize with the newer drugs. The aim of this literature review is to bring to a focus the integrated knowledge about drug-induced gingival overgrowth and ameliorate about the concepts of its treatment. Cyclosporin is a powerful immunosuppressant widely used for prevention of transplant rejection as well as for management of a number of autoimmune conditions. However, cyclosporin may have damaging side effects, such as nephrotoxicity, hepatotoxicity, hypertension, and gingival overgrowth. The first time gingival overgrowth with cyclosporin therapy was described in the dental literature in 1983 by both Rateitschak-Plüss et al., and Wysocki et al. Recently, Greenberg et al.,  studied a sample of 115 patients that underwent kidney transplants and found a gingival overgrowth prevalence of 53% among those who were treated with cyclosporin. A differential diagnosis requires thorough medical and dental histories, a careful evaluation of nature of enlargement, and an identification of the etiologic factors. A biopsy specimen may be required to confirm diagnosis. The primary aim of nonsurgical approaches is to reduce the inflammatory component in the gingival tissues and thereby avoid the need for surgery. Drug induced gingival overgrowth is one of the most widespread unwanted effect of systemic medication on the periodontal tissues. However, our understanding of the pathogenesis of gingival overgrowth is incomplete at best. Hence, it would be pertinent to identify and explore possible risk factors relating to both prevalence and severity of drug-induced gingival overgrowth. Newer molecular approaches are needed to clearly establish the pathogenesis of gingival overgrowth and to provide novel information for the design of future preventive and therapeutic modalities. 1. Marshall RI, Bartold PM. Medication induced gingival overgrowth. Oral Dis 1998;4:130-51. 2. Seymour RA, Thomason JM, Ellis JS. 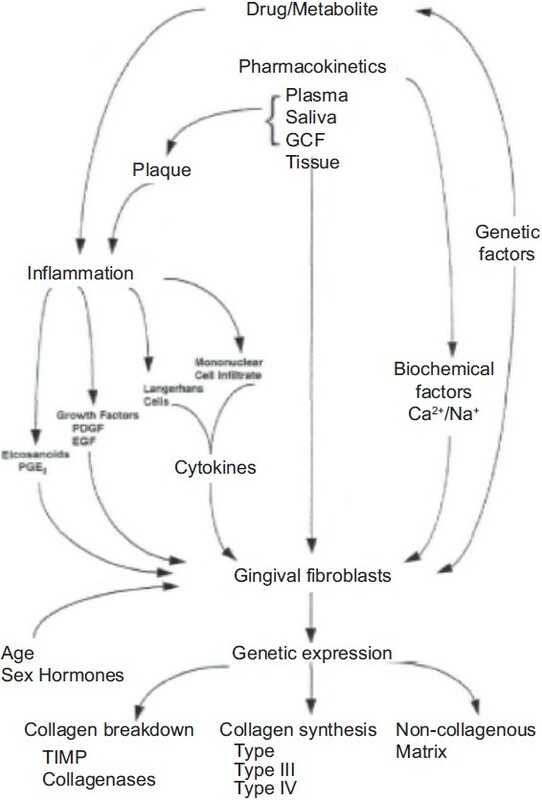 The pathogenesis of drug-induced gingival overgrowth. J Clin Periodontol 1996;23:165-75. 3. Seymour RA, Ellis JS, Thomason JM. 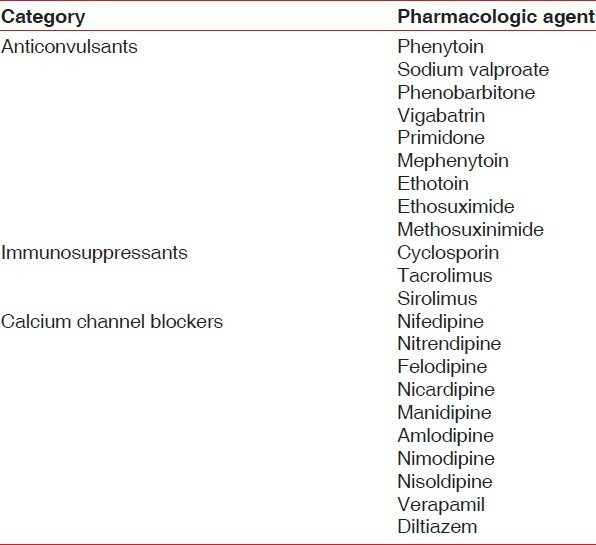 Risk factors for drug-induced gingival overgrowth. J Clin Periodontol 2000;27:217-23. 4. Dongari A, McDonnell HT, Langlais RP. Drug-induced gingival overgrowth. Oral Surg Oral Med Oral Pathol 1993;76:543-8. 5. Marshall RI, Bartold PM. A clinical review of drug-induced gingival overgrowths. Aust Dent J 1999;44:219-32. 6. Hallmon WW, Rossmann JA. The role of drugs in the pathogenesis of gingival overgrowth. A collective review of current concepts. Periodontol 2000 1999;21:176-96. 7. Cota LO, Oliveira AP, Costa JE, Cortelli SC, Costa FO. Gingival status of Brazilian renal transplant recipients under sirolimus-based regimens. J Periodontol 2008;79:2060-8. 8. Cota LO, Aquino DR, Franco GC, Cortelli JR, Cortelli SC, Costa FO. Gingival overgrowth in subjects under immunosuppressive regiments based on cyclosporine, tacrolimus, or sirolimus. J Clin Periodontol 2010;37:894-902. 9. Cota LO, Viana MB, Moreira PR, Gomez RS, Cortelli JR, Cortelli SC, et al. Gingival overgrowth in cyclosporin, tacrolimus, or sirolimus-based immunosuppressive regiments and the single nucleotide IL-6 (-174 G/C) gene polymorphism. Arch Oral Biol 2010;55:494-501. 10. Fay AA, Satheesh K, Gapski R. Felodipine-influenced gingival enlargement in an uncontrolled type 2 diabetic patient. J Periodontol 2005;76:1217. 11. Ikawa K, Ikawa M, Shimauchi H, Iwakura M, Sakamoto S. Treatment of gingival overgrowth induced by manidipine administration: A case report. J Periodontol 2002;73:115-22. 12. Seymour RA, Ellis JS, Thomason JM, Monkman S, Idle JR. Amlodipine-induced gingival overgrowth. J Clin Periodontol 1994;21:281-3. 13. Pereira R, Chava V. Amlodipine induced gingival hyperplasia. J Indian Soc Periodontol 2000;3:89-90. 14. Lafzi A, Farahani RM, Shoja MA. Amlodipine-induced gingival hyperplasia. Med Oral Patol Oral Cir Bucal 2006;11:E480-2. 15. Sharma S, Sharma A. Amlodipine-induced gingival hyperplasia - A case report. J Indian Dent Assoc 2010;4:285-7. 16. Ono M, Tanaka S, Takeuchi R, Matsumoto H, Okada H, Yamamoto H, et al. Prevalence of amlodipine-induced gingival overgrowth. Int J Oral Med-Sci 2010;9:96-100. 17. Shah C, Joshi S, Sinha S, Parmar M, Joshi C. Amlodipine-induced gingival enlargement-A case series. J Indian Dent Assoc 2011;5:919-22. 18. Sucu M, Yuce M, Davutoglu V. Amlodipine-induced massive gingival hypertrophy. Can Fam Physician 2011;57:436-7. 19. Dongari-Baqtzoglou A, Research, Science and therapy committee, american academy of periodontology. 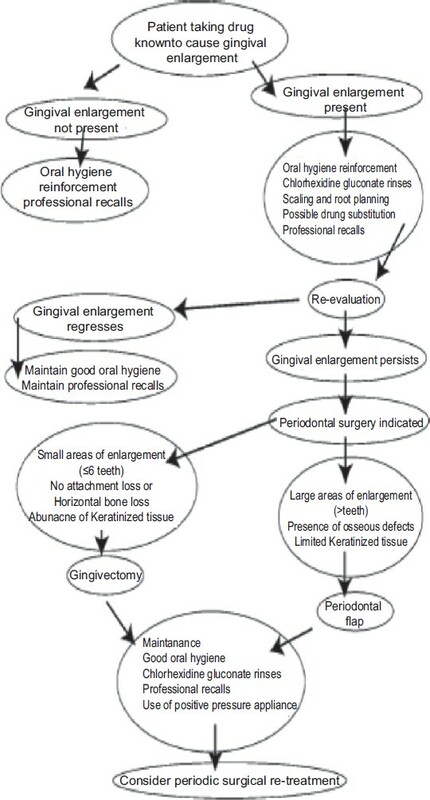 Drug-associated gingival enlargement. J Periodontol 2004;75:1424-31. 20. Kantarci A, Nseir Z, Kim YS, Sume SS, Trackman PC. Loss of basement membrane integrity in human gingival overgrowth. J Dent Res 2011;90:887-93. 21. Sume SS, Kantarci A, Lee A, Hasturk H, Trackman PC. Epithelial to mesenchymal transition in gingival overgrowth. Am J Pathol 2010;177:208-18. 22. Subramani T, Rathnavelu V, Yeap SK, Alitheen NB. Influence of mast cells in drug-induced gingival overgrowth. Mediators Inflamm 2013;2013:275172. 23. Subramani T, Senthilkumar K, Periasamy S, Rao S. Expression of angiotensin II and its receptors in cyclosporine-induced gingival overgrowth. J Periodontal Res 2013;48:386-91. 24. Newman MG, Takei H, Klokkevold PR, Carranza FA. Carranza's Clinical Periodontology. 10 th ed. St Louis: Saunders, Elsevier; 2006. p. 375-376. 25. Lafzi A, Farahani RM, Shoja MA. Phenobarbital-induced gingival hyperplasia. J Contemp Dent Pract 2007;8:50-6. 26. Rodríguez-Vázquez M, Carrascosa-Romero MC, Pardal-Fernández JM, Iniesta I. Congential gingival hyperplasia in a neonate with foetal valproate syndrome. Neuropediatrics 2007;38:251-2. 27. Mesa F, Aguilar M, Gonzalez-Moles MA, Guerrero A, Sanchez-Alvarez JC, Del Moral RG, et al. Vigabatrin-induced modification of Ki-67 expression in gingival epithelium: Immunohistochemical study of a short series. J Periodontal Res 2004;39:66-71. 28. Doufexi A, Mina M, Ioannidou E. Gingival overgrowth in children: Epidemiology, pathogenesis, and complications. A literature review. J Periodontol 2005;76:3-10. 29. Wentz LA, Oliveira SC, Moreira CH, Rösing CK. Low prevalence of gingival overgrowth associated to new immunosuppressive protocols with cyclosporin. Braz Oral Res 2012;26:64-70. 30. Greenberg KV, Armitage GC, Shiboski CH. Gingival enlargement among renal transplant recipients in the era of new-generation immunosuppressants. J Periodontol 2008;79:453-60. 31. James JA, Boomer S, Maxwell AP, Hull PS, Short CD, Campbell BA, et al. Reduction in gingival overgrowth associated with conversion from cyclosporin A to tacrolimus. J Clin Periodontol 2000;27:144-8. 32. Paixão CG, Sekiguchi RT, Saraiva L, Pannuti CM, Silva HT, Medina-Pestana J, et al. Gingival overgrowth among patients medicated with cyclosporin A and tacrolimus undergoing renal transplantation: A prospective study. J Periodontol 2011;82:251-8. 33. Sekiguchi RT, Paixão CG, Saraiva L, Romito GA, Pannuti CM, Lotufo RF. Incidence of tacrolimus-induced gingival overgrowth in the absence of calcium channel blockers: A short-term study. J Clin Periodontol 2007;34:545-50. 34. Nassar CA, Nassar PO, Andia DC, Guimarães MR, Spolidorio LC. The effects of up to 240 days of tacrolimus therapy on the gingival tissues of rats--a morphological evaluation. Oral Dis 2008;14:67-72. 35. Kaur G, Verhamme KM, Dieleman JP, Vanrolleghem A, van Soest EM, Stricker BH, et al. Association between calcium channel blockers and gingival hyperplasia. J Clin Periodontol 2010;37:625-30. 36. Mavrogiannis M, Ellis JS, Thomason JM, Seymour RA. The management of drug-induced gingival overgrowth. J Clin Periodontol 2006;33:434-9. 37. Dhale RP, Phadnaik MB. Conservative management of amlodipine influenced gingival enlargement. J Indian Soc Periodontol 2009;13:41-3. 38. Srivastava AK, Kundu D, Bandyopadhyay P, Pal AK. Management of amlodipine-induced gingival enlargement: Series of three cases. J Indian Soc Periodontol 2010;14:279-81. 39. Lu HK, Tseng CC, Lee YH, Li CL, Wang LF. Flutamide inhibits nifedipine- and interleukin-1 beta-induced collagen overproduction in gingival fibroblasts. J Periodontal Res 2010;45:451-7. 40. Camargo PM, Melnick PR, Pirih FQ, Lagos R, Takei HH. Treatment of drug-induced gingival enlargement: Aesthetic and functional considerations. Periodontol 2000 2001;27:131-8. 41. de la Rosa García E, Mondragón Padilla A. Effect of mycophenolate mofetil and azathioprine on gingival enlargement associated with cyclosporin A use in kidney transplant patients. Nefrologia 2009;29:474-8. 42. Ambooken M, Emmatty R, Mathew JJ, Kuriakose A. Drug substitution in the management of amlodipineinduced gingival overgrowth: A case report. Indian Dentist Res Rev 2011:22-4.